A desktop client can be installed and registered in unattended mode (silently) by running the executable file from the command-line. Note: You should not rename the downloaded executable file when conducting a silent installation. The name of the executable file determines both branding settings and the current version of the desktop client. If you alter the name of the executable file, branding settings will not be reflected, and the current version of the desktop client will not be installed. Run the executable file from the command-line using the following arguments, making sure to replace the bold text with information appropriate to the specific environment and user. The following example will register the desktop client using the agent_cmdui.exe file located in the installation directory bin folder. 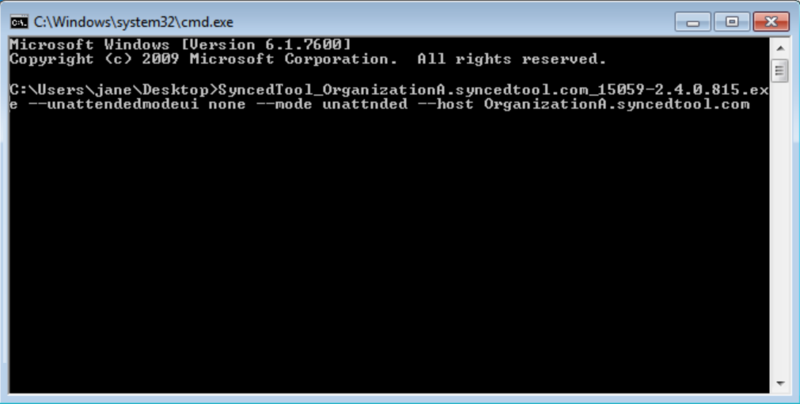 From the command-line, navigate to the Synced Tool installation directory (for example, C:\Program Files (x86)\SyncedTool). 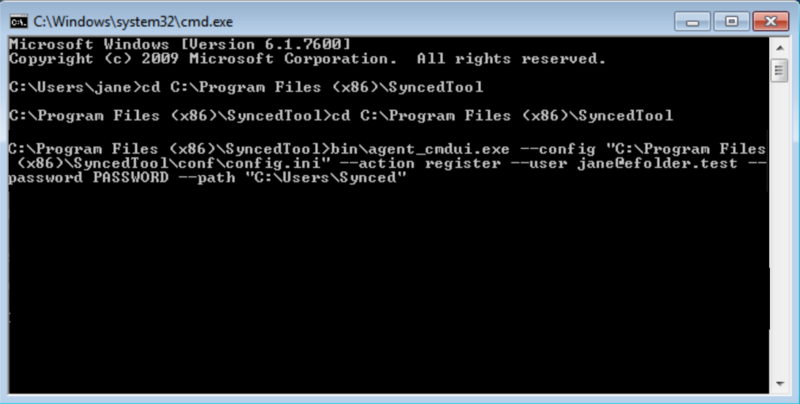 bin\agent_cmdui.exe --config "C:\Program Files (x86)\SyncedTool\conf\config.ini" --action register --user jane@efolder.test --password PASSWORD --path "C:\Users\Synced"
Note: Make sure that you execute agent_cmdui.exe from its parent folder (for example, C:\Program Files (x86)\SyncedTool) as noted in the example above.